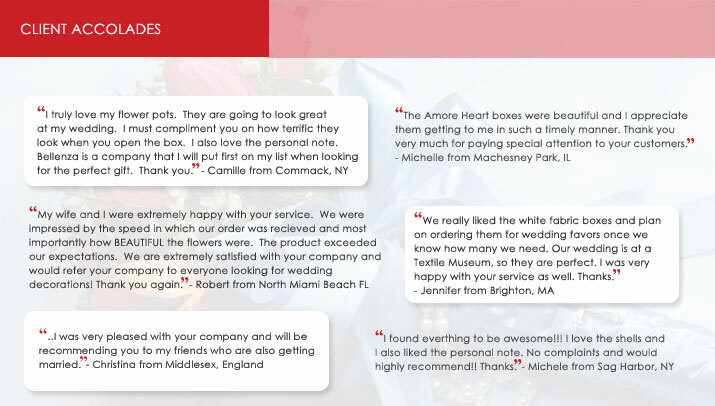 More Words from Happy Clients! I am planning a bridal shower tea and I was so surprised to receive my order of tulle purses yesterday. Thank you for processing my order so quickly! We wanted elegant wedding favors for our luau themed party, I was so thrilled to find your pretty shell trays! Their just perfect for the seashell cookies we plan to make. For my parents golden wedding anniversary, I was really excited to find your gold picture frames. They look even better than the pictures. Thanks so much to all! I really enjoy navigating through your website. It made so much easier to find what I wanted. The fuchsia wraps we ordered will be perfect for our wedding. Luv it! For my daughter’s baptism, we were looking for something elegant to give guests. I’m so happy to find the porcelain boxes as they match our theme. I really enjoyed the pictures from your Modern Vintage article. We were thinking of a real cool theme and I’m glad I stumbled upon your great site. Many many thanks! My mom and I are so happy to have found your flower petal bags; we couldn’t find anything that could match my wedding’s color palette of green and orange! I’m so glad that I found your website after searching for days! The flower pots we found are just gorgeous and will fabulous for our garden theme. Are you a former client at Bellenza? If so, just send us your review and we’d be happy to share it with our clients.